A few weeks before NAMM, Fender announced a limited run of 2 signature models of the Jimmy Page Telecaster. A few weeks before NAMM, Fender announced a limited run of 2 signature models of the Jimmy Page Telecaster. These were limited to 50 pieces of each worldwide, they were made in their Custom Shop and were quickly sold out. 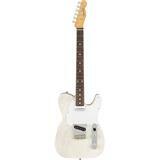 But don’t worry, Fender is now announcing a production run of both models! The Mirror Telecaster features a two piece ash body, lacquer finish and a pair of Jimmy Page Custom '59 Tele pickups that deliver the seductive, full tone that inspired all of the unforgettable licks on Led Zeppelin's first album. The custom "Oval-C" -shaped maple neck has a 7.25 "radius rosewood fingerboard with 21 vintage style frets and provides a pleasant and comfortable feel. Included in the vintage tweed case are eight round mirrors (a tribute to the modifications that were later applied to the guitar), a black coiled cable, vintage style “stained glass” strap and a certificate of authenticity. 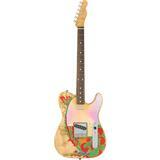 The Dragon Telecaster has a two piece ash body that has been stripped and hand dyed to the original design of Page - colorful curls of green, orange, yellow, blue and red that swing around the guitar in a tortuous manner, just like a dragon. The custom "Oval-C" -shaped maple neck has a 7.25 "radius with rosewood fretboard and 21 vintage style frets, giving the neck a smooth feel, and this Dragon Telecaster comes with a pair of Jimmy Page Custom Tele pickups. Included in the vintage tweed case are a red coiled cable and a vintage style “stained glass” strap.